Adrian and I have had the past several days on our own, hanging around the pool and beach, relaxing. Today, however, we rented a car to tour the island. We picked Seth up from his final breakfast meeting and headed out to sight see. I felt I was retracing dad’s steps as we headed out of Honolulu toward Hanauma Bay, Sandy Beach, Makapu Point, and more. I heard his voice in my head, telling me about the things he loved, the places he’d been, and the memories he had of this place as a 17 year old in the Navy. I felt him around me and knew he was here. I drove through Waimanalo and Kailua, thinking of the times we’d been there. I headed toward the north shore, and remembered our visits there. He was right there with me, guiding me along, and making me remember our times here. 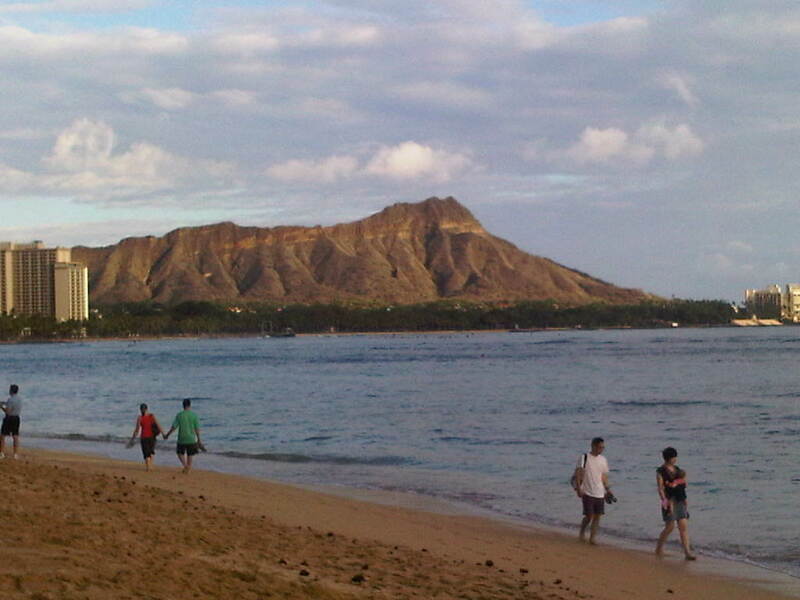 It was something I hadn’t expected – to find him here so poignantly, so vibrantly, in the sights and stops on Oahu. I finished up our adventure by returning to Honolulu across the Pali Highway, the pass where he learned to drive at the tender age of 17. We stopped at the lookout point and he was all around me there. Tonight at the pool, as we were getting ready to leave for dinner, there was an older gentleman in khaki shorts, an aloha shirt, white socks and sneakers, along with a panama hat, and I felt I was seeing him. He was there, among his extended family, holding court. I didn’t know if I should just cry or go up and hug him – but in that moment, I felt dad and needed you all to share that with me. I hadn’t really thought about how this trip would hit me regarding dad. I have to say that it is both a joy and a huge sadness to be here without him. I guess the joy outweighs the sad, but it’s there, and I have to acknowledge it. I miss him and the times we had here, but am so very grateful for that time. I wouldn’t have missed it for the world. Here’s to a trip here together next summer as a family to celebrate his life. He really is a part of this place, and I look forward to sharing it with you all. I miss the big guy. This entry was posted in Family, General Rambling, Spirituality. Bookmark the permalink. Erin Leary Writes by Erin Leary is licensed under a Creative Commons Attribution-NonCommercial-NoDerivs 3.0 Unported License. Flash fiction, poetry and other written works that make me who I am. All That's Interesting, Inspiring and Thought-Provoking! "trashing today for a better tomorrow"